Where can I purchase a Turvasiru for my pet? The Turvasiru service, including microchip installation, is currently offered by animal welfare associations and veterinarians. Any animal with any microchip can be signed up for the Turvasiru service! Will Turvasiru bring my lost friend back? What exactly happens if my pet is lost and then found? Usually animals that have been relocated are delivered to an animal shelter, a veterinarian's clinic, animal welfare associations or the authorities, who are then able to identify the pet with the chip number. The animal is identified via a small microchip inserted beneath its skin. The chip will only contain the animal’s unique chip number. With the help of Turvasiru’s online services, the authorities and animal shelters are able to locate the pet owner’s contact information with the chip number, enabling them to return the lost friend to its home. The activation code is an identification or checksum code available in our online shop. The activation code allows you to sign your pet up for the service and receive your personal user ID for the Turvasiru.fi website. The activation codes also allow you to enter new pets with an existing user ID. One activation code enables one pet to be signed into the system. The activation code costs €20 / pet. How can I register my pet for the Turvasiru service? You can purchase the activation code for signing up the pet in Turvasiru’s online shop. After paying for the purchase and receiving the activation codes, you can sign your pet up for the service. Enter your pet’s information by clicking the "USE ACTIVATION CODE" link. When the animal's identification information and the owner's contact information is entered onto Turvasiru’s register, the owner is provided with a personal user ID and password, enabling them to review and modify their information online. We recommend using Firefox 8.0 or later. Download the browser HERE. If you are using Internet Explorer, ensure that you are using IE7 at least. IE9 is recommended. 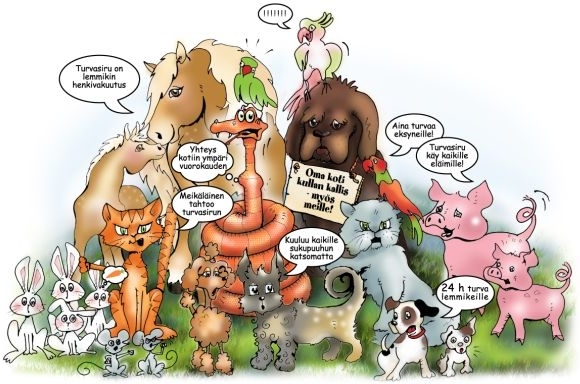 Contact your local animal welfare association or veterinarian and get Turvasiru for your pet!